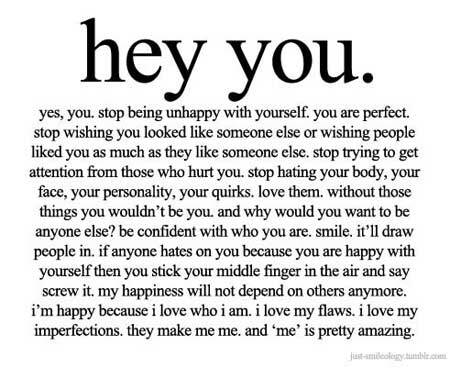 Hey you, yes, you, Stop being unhappy with yourself, You are perfect. you are perfect. stop wishing you looked like someone else or wishing people liked you as much as they like someone else. stop trying to get attention from those who hurt you. stop hating your body, your face, your personality, your quirks. love them. without those things you wouldn’t be you. and why would you want to be anyone else? be confident with who you are. smile. it’ll draw people in. my happiness will not depend on others anymore. i’m happy because i love who i am. i love my flaws. i love my imperfections. they make me me. and ‘me’ is pretty amazing.